Israeli navy boats opened machinegun fire at Palestinian fishing boats off the coast of northern Gaza Strip on Tuesday morning. Palestinian sources said that no casualties were reported in the shooting that took place while the fishermen while trying to fish in Gaza’s regional waters. The Israeli navy restricts the fishing area for the Palestinian fishermen to less than six nautical miles that was specified in the calm agreement brokered between Palestinian resistance and the Israeli occupation authorities under Egyptian auspices in November 2011. A number of Palestinian citizens suffered breathing difficulty afternoon Monday in an Israeli army raid on Aroub refugee camp north of Al-Khalil. Eyewitnesses said that confrontations broke out in the camp after Israeli occupation forces (IOF) stormed it in six army vehicles and fired teargas canisters at young men who threw stones and bottles at the invading troops. 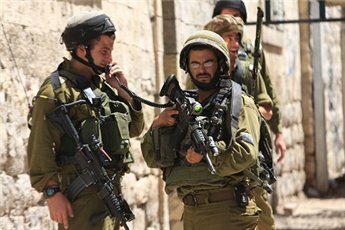 They said that the soldiers deliberately fired teargas at Palestinian houses causing a number of suffocation cases among the inhabitants. The confrontations lasted for hours, the sources said, adding that the soldiers took shots of young men and fired sound bombs in the camp alleys. Four people were injured on Monday during clashes between Palestinian farmers and Israeli settlers in the south Hebron hills, locals said. 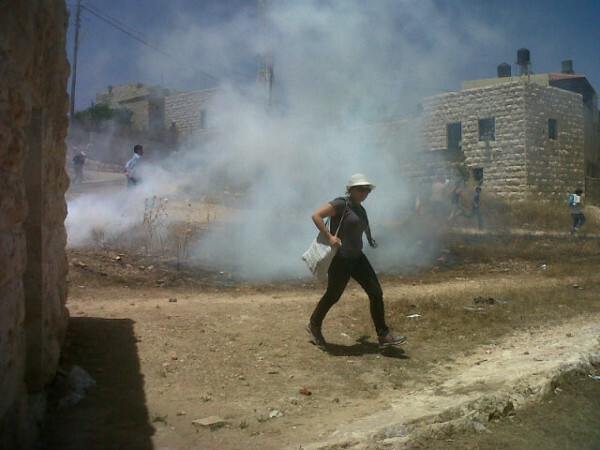 The clashes occurred after settlers attacked a group of farmers tending their land. 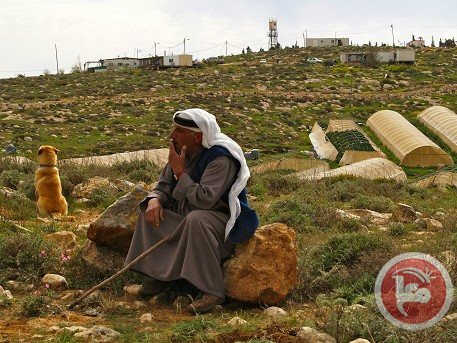 Ismail al-Adra said that ten settlers attacked him and several other farmers while they were on their way to tend their fields. 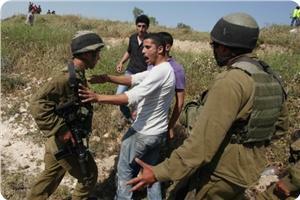 Locals told Ma'an that a Palestinian farmer and three settlers were injured during the brawl. 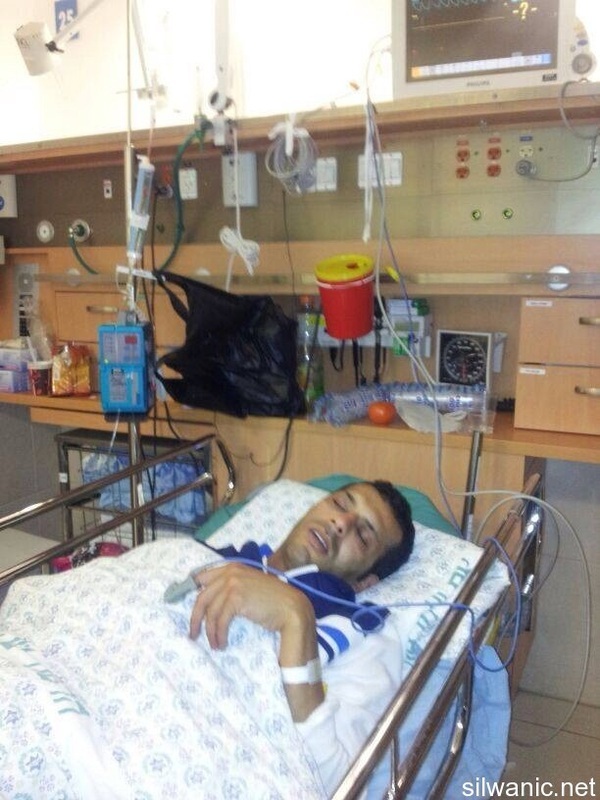 One farmer, Sabir al-Adra, was hit in the face with a steel pipe. Another farmer, Mousa al-Adra, was also attacked and injured, together with a foreign solidarity activist who was filming the settler attack. 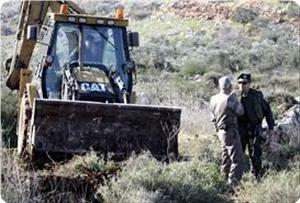 Israeli forces arrived at the scene and detained a number of farmers, accusing them of attacking settlers. 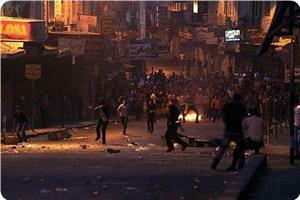 An Israeli army spokeswoman confirmed the clashes and said four people were injured, one Palestinian and three Israelis. Nine Palestinians were detained and transferred to the custody of the Israeli police, she added. There are several radical Jewish outposts in the south Hebron hills, with settlers regularly attacking local Palestinians with impunity. 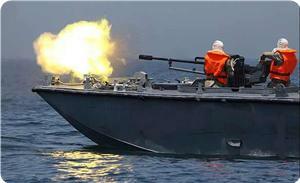 Israeli navy gunboats opened heavy machinegun fire at Palestinian fishing boats off the coast of northern Gaza Strip on Monday morning. 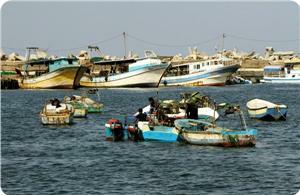 Eyewitnesses said that the shooting forced the fishermen to abandon their ships and go back to land. No casualties were reported. Israeli navy targets Palestinian fishing boats off the coasts of Gaza Strip on daily basis and deprive them of their right to fish outside a restricted area of three nautical miles. 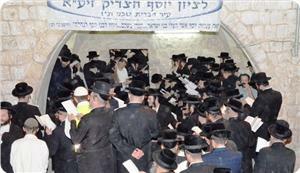 He added that the settlers of Yitzhar colonial settlement involved in the attack. The students were conducting their midterm final examinations. 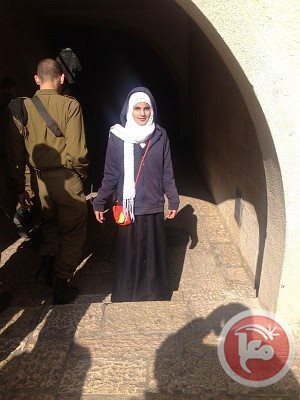 An Israeli man on Sunday assaulted a Palestinian girl in the al-Sharaf neighborhood of the Old City of Jerusalem, her father said. He said his daughter, 12-year-old Marah Munther Jalajel, was beaten by an Israeli "settler" on her way to school. She was walking with her cousin through al-Sharaf when the man attacked Marah, her father said. He said the man "struck her in the back, causing her to fall down, then proceeded to hit her on the back, stomach, and head." Her cousin "managed to escape and call for help, and a young man came to the area to help Marah." Marah suffered "several bruises," her father said, adding that he had notified the police. Police spokesman Micky Rosenfeld said he was unfamiliar with the incident. Israeli occupation forces (IOF) attacked citizens in Um Al-Khair hamlet near Yatta town, south of Al-Khalil, on Saturday night. Activist Ratib Al-Jabour told the PIC that IOF soldiers broke into the hamlet and attacked citizens with their rifle butts to provide protection for settlers from the nearby settlement of Karma’il. He said that the soldiers were trying to prevent citizens from making use of services in the hamlet. IOF soldiers and Jewish settlers in the area try to turn the lives of inhabitants of the hamlets near Yatta into hell in a bid to force them leave their homes and lands in order to make way for expanding Jewish settlements. Israeli soldiers violently assaulted several Palestinians in Um Al-Kheir village, east of Yatta, near the southern West Bank city of Hebron. Rateb Jabour, coordinator of the Popular Committee Against the Wall in Hebron, stated that dozens soldiers invaded the village and attacked several residents. Two of the attacked Palestinians have been identified as Hajj Suleiman Al-Hathaleen and Sofian Al-Hathaleen. The soldiers said they invaded the village because Israeli settlers, of the nearby Karmiel illegal settlement, “were annoyed” with noises coming from the village’s bakery. Jabour said that, nearly a month ago, extremist settlers demolished a clay oven that belongs to members of the Al-Hathaleen family despite an Israeli High Court order against its destruction. The clay oven provides bread for more than 40 residents in the village. In related news, Israeli settlers placed several mobile homes in the Tal Romeida neighborhood after bulldozing a land that belongs to members of the Abu Haikal family. The land, planted with almond trees, is nearly 5 Dunams (1.23 Acres). Abdul-Hady Kantash, a Palestinian expert in maps and Israeli settlements, said that the settlers aim at expanding the Ramat Yishai illegal outpost. Palestinian medical sources have reported that several Palestinians have been injured by Israeli army fire in Beit Ummar town, north of Hebron, in the southern part of the occupied West Bank. The Ma'an News Agency has reported that several residents suffered the effects of teargas inhalation in the Aseeda area, in Beit Ummar, and that the soldiers fired rounds of live ammunition and rubber-coated metal bullets. Mohammad Awad, spokesperson of the Popular Committee Against the Wall in Beit Ummar, said several residents suffered serious effects of gas inhalation. Awad added that an explosion occurred near an Israeli military tower, at the northern entrance of Beit Ummar, and that the soldiers began firing rounds of live ammunition before more army jeeps arrived at the scene and chased residents in the region, leading to clashes with them. Earlier on Friday, an Israeli military jeep caused damage to a Palestinian car near the town. Awad said that while the jeep was driving from the Halhoul area, towards Beit Ummar, one of its wheels was detached and struck a car, causing excessive damage. Violent clashes erupted in Romana town in Jenin between Palestinian youths and Israeli occupation forces who intensively fired tear gas bombs. Casualties were reported among Palestinians. According to local sources, 10 Israeli military vehicles stormed Romana town on Friday night and erected a checkpoint near UNRWA school, which led to the outbreak of the clashes. The IOF soldiers fired barrage of stun grenades and tear gas bombs and attacked a number of citizens who were detained at the entrance to the town, the sources added. More than 20 youths suffered from suffocation after inhaling gas during the clashes, the sources said, adding that a number of citizens suffered breathing difficulty in their houses. Meanwhile, clashes broke out between IOF soldiers and dozens of Palestinians Thursday evening in Bab al-Zawiya in al-Khalil, where some of them were reportedly injured. Eyewitnesses confirmed that one person sustained burn injuries when Israeli forces fired sound and gas bombs, while dozens suffered breathing problems due to inhaling tear gas. 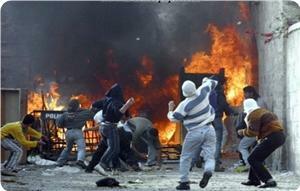 In their turn, Palestinian youths threw stones and empty bottles at the invading forces. The sources pointed out that Israeli soldiers had provoked the citizens when they intensified firing of tear gas and sound bombs and deliberately attacked a number of children while passing nearby a military checkpoint before the outbreak of the clashes. Israeli forces injured two Palestinians and detained one after protests broke out in three West Bank towns on Friday. 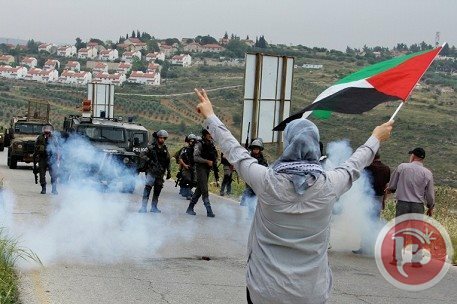 The weekly protests against the Israeli occupation and the separation wall were dispersed by Israeli forces with rubber bullets and tear gas in Bilin, Kafr Qaddum, and al-Masara. Two were injured and dozens of Palestinian as well as Israeli and international solidarity protesters suffered from excessive use of tear gas in the weekly protest in the central West Bank town of Bilin on Friday. Israeli forces opened fire with rubber-coated bullets, tear gas canisters, and stun grenades in the direction of protesters as the demonstration arrived near village lands near the wall. 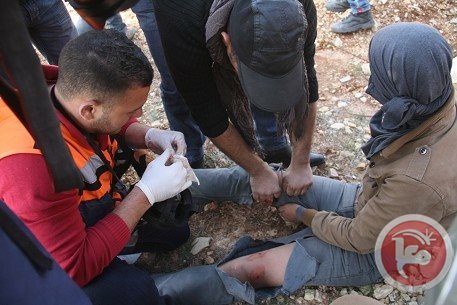 Abd al-Rahman Beitillu, 16, was shot in the leg and Palestine TV cameraman Najib Sharawna suffered from extremely severe tear gas inhalation and had to be taken to the Palestine Medical Complex in Ramallah. The march was held in memory of the 49th anniversary of the launch of the "contemporary Palestinian resistance," which refers to the Jan. 3, 1965 operation that launched the Fatah movement. The protest also marked the third anniversary of the death of Palestinian activist Jawaher Abu Rahmah, who was died after choking to death on tear gas fired by Israeli forces during a Bilin protest. During the protest, the Italian Association for Peace "Assopace" in cooperation with the Human Supporters Association in Nablus performed a puppet show depicting their opposition to injustice. The participants raised Palestinian flags and banners of the Fatah movement, and marched along the streets of the village chanting slogans calling for national unity. 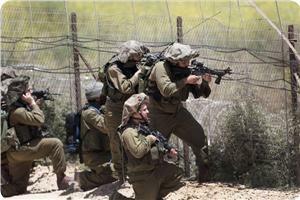 Israeli forces shot and injured two Palestinians east of Jabaliya in the northern Gaza Strip on Friday. The shootings followed protests that broke out after the funeral procession of Adnan Abu Khater, 16, a Palestinian youth who died earlier on Friday after being shot by Israeli soldiers on Thursday. A 21-year-old man from al-Shati refugee camp was shot in the foot near the eastern cemetery in Jabaliya. He was taken to Kamal Adwan hospital with moderate injuries. A spokesman for the Gaza Ministry of Health said that another 26-year-old man was shot in the back by Israeli soldiers in a watchtower in the same area. An Israeli army spokeswoman told Ma'an that a "violent riot erupted" after "dozens of Palestinians gathered" and were "damaging the fence" by throwing rocks and burning tires. "During attempts to disperse the riots, soldiers opened fire at the instigators' lower extremities and a hit was confirmed," she added. Two Palestinian citizens were wounded on Friday night when Israeli occupation forces (IOF) fired at a group of civilians to the east of Jabalia, north of the Gaza Strip. Medical sources told the PIC reporter that Khaled Oda, 21, and Thaer Rabaya, 26, were injured in the incident. They said that the victims were hospitalized where the injury of Rabaya was described as serious, as he was hit with a bullet in the back. The IOF did not stop violating the calm agreement reached between Israel and resistance factions in Gaza under Egyptian patronage in Cairo in November 2012 killing 14 Palestinians so far and wounding dozens others. Israeli war planes launched strikes against the Gaza Strip early Friday, the army said, shortly after a rocket from the besieged coastal enclave hit an Israeli area. A statement from the army said that "in response to rocket fire toward Israel," its "aircraft targeted a terror infrastructure site in the central Gaza Strip and three concealed rocket launchers in the northern Gaza Strip." "Direct hits were confirmed," the statement read. Palestinian sources within Gaza said that the strikes targeted agricultural land near al-Maghazi refugee camp in central Gaza, the town of Beit Hanoun in the north, and another neighborhood in eastern Gaza City. Late Thursday night a projectile fired from the Strip hit southern Israel, causing no harm or damage, an Israeli police spokeswoman told AFP. Earlier Thursday, a Palestinian man was shot and injured by Israeli forces near the border in the northern Gaza Strip. An Israeli army spokeswoman said the man was "damaging" the border fence, and that Israeli soldiers resorted to shooting him in the leg. The Israeli news site Ynet reported he was "throwing stones" at the separation barrier. The shooting and the airstrikes come approximately a week after an upheaval in violence in Gaza left two dead and several injured. On Dec. 24, Israeli airstrikes killed a 3-year-old Palestinian girl and injured several others after a Palestinian sniper killed an Israeli Civil Defense employee working at the border. The IDF launched airstrikes on three Gaza Strip targets. Military sources reported that rocket launchers and observation posts were destroyed. The strikes, the sources noted, were in retaliation for Palestinian rocket fire on Israeli territory. On Thursday evening a Qassam rocket was launched from the Gaza Strip and exploded in an open area at the Sdot Negev Regional Council. The rocket hit away from residential area and a color red alert was therefore not activated. No injuries or damage were reported. On Monday a rocket exploded between two residential communities in the Shaar Hanegev Regional Council. No injuries or damages were reported. Prime Minister Benjamin Netanyahu and Defense Minister Moshe Ya'alon vowed to retaliate any attack from the strip. "We will strike those who open fire and strike those who advocate them. No one will be immune," Netnyahu said last week. The IDF stated that "Terror groups in the strip have set a goal to harm Israeli citizens. The IDF will continue to work diligently and as much as it takes against any source that executed terror against the State of Israel." The IDF statement added: "The terror group Hamas is the address and it is the accountable entity." Israeli warplanes have carried out a series of strikes in the besieged Gaza Strip, the regime’s military has said. 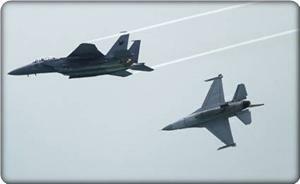 The aircraft targeted four sites in the central and northern Gaza Strip during the early hours of Friday, the military said in a statement. Early on Thursday, a Palestinian youth was shot and wounded by Israeli soldiers near the border fence in the northern Gaza Strip. On Sunday, Palestinians said two people were wounded by Israeli tanks in central Gaza. Gaza Prime Minister Ismail Haniyeh said Thursday that Hamas did not seek a new war with Israel, a week after an upheaval of violence in the Strip left an Israeli civil defense employee and a Palestinian toddler dead. "We always expect treacheries from our enemy, yet our people shouldn't be obsessed with a new war," Haniyeh said at the graduation of a class of security officers in Gaza City. 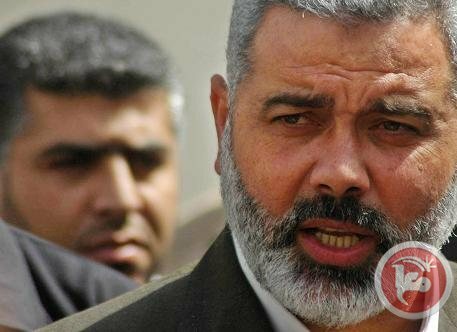 But Haniyeh also noted that Hamas was ready to face any emergency. Hamas, he added, is ready to "mitigate relations with our Arab brothers, and despite the fog which overshadowed the relation with Egypt." "We can't do without Egypt or other Arab countries," Haniyeh said. Haniyeh said his government would soon make major moves "to create a better environment to help achieve national and communal reconciliation. Every single Palestinian citizen will feel these decisions." Soon after the Muslim Brotherhood was declared a terror organization in Egypt, PLO officials called on Hamas to break its ties with the Brotherhood, some referring to the latter as a "terrorist group." In late December, both Fatah and Hamas officials said they had renewed their commitment to national reconciliation. A Palestinian youth was seriously wounded to the east of Gaza city on Thursday evening at the hands of Israeli occupation forces (IOF). Dr. Ashraf Al-Qudra, the health ministry spokesman, said that the young man, a teenager, was hit with a bullet in his pelvis. He said that the teen was transferred to Shifa hospital in Gaza city in serious condition. IOF soldiers recently escalated their incursions and shelling along the eastern borders of Gaza Strip. A Palestinian man was shot and injured on Thursday by Israeli forces in the northern Gaza Strip, medics said. 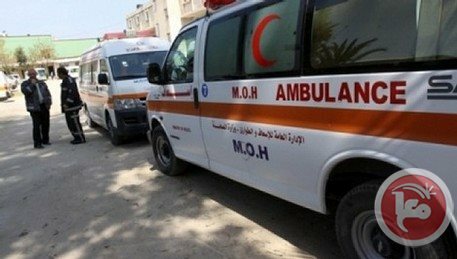 Medics told Ma'an that the man was shot near a cemetery east of Jabaliya and was taken in an ambulance to the hospital in moderate condition, without providing further details. An Israeli army spokeswoman said that a number of Palestinians approached the Israel-Gaza border fence and "began damaging it" on Thursday afternoon. After asking the men to stop "several times" the Israeli soldiers "resorted to aiming fire at their lower extremities," identifying one hit. The spokeswoman did not provide any information as to how the Palestinians were damaging the separation barrier. The shooting comes approximately a week after an upheaval in violence in the Gaza Strip left two dead and several injured. The Israeli occupation forces (IOF) stormed at dawn Thursday several areas in al-Khalil south of the West Bank, and arrested 13 citizens, including minors. Israeli soldiers, reinforced by military vehicles, raided several neighborhoods in the village of Tabaka western Dura city in al-Khalil, where they opened fire and fired tear gas grenades at residents. 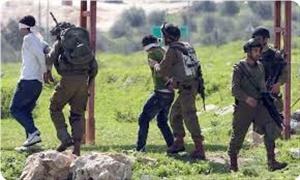 Eyewitnesses reported that the IOF arrested 12 Palestinians, including five minors between the ages of 13 and 16 years, after attacking them. The Israeli soldiers were deployed in several areas inside the village and on the roofs of several houses during the arrest campaign, and threatened to shoot and arrest the citizens if they throw stones at the military patrols. Meanwhile, the IOF stormed the neighborhood of Nemra, in the center of al-Khalil, and arrested a student at the Palestine Polytechnic University Munir Dofesh, who had been recently released from the Palestinian intelligence service's prison. Eyewitnesses stated that clashes erupted between the soldiers and the citizens during the arrest of Dofesh, while an Israeli force surrounded the entrances of al-Khalil and erected barriers. Another young man Nadi Hawamdeh was arrested in the village of Samu. The IOF also stormed the towns of Dhahiriyya and Tappuah, while Israeli aircrafts were intensively flying over the area until the withdrawal of the military forces. Aroub refugee camp also witnessed confrontations at late hours of last night between Palestinian citizens and Israeli forces at its main entrance adjacent to the bypass road No. 60. Israeli occupation forces (IOF) stormed Jenin city on Wednesday night and occupied the rooftop of a citizen’s house to monitor movement of citizens. Local sources said that the soldiers occupied the rooftop of Majd Tobasi’s house for hours after roaming the streets of Marah area and Jabariyat suburb. Meanwhile, the sources said that Jewish settlers from Haramish settlement, built on Yabad village land south of Jenin, assaulted and beat up a Palestinian boy, Ahmed Abu Ermaila, on Wednesday night. They said that the IOF soldiers and settlers were deployed in the vicinity of Yabad on the same night and combed nearby areas. Israeli soldiers invaded Al-‘Ezariyya town, southeast of occupied East Jerusalem, and kidnapped one Palestinian. Local sources have reported that the soldiers violently broke into several homes and searched them, before kidnapping a young man identified as Fadi Tamimi. The sources added that clashes took place late on Wednesday at night in the Ras Kabsa area, between Al-Ezariyya and Abu Dis, after the army invaded them. The soldiers fired several gas bombs, concussion grenades and rubber-coated metal bullets. 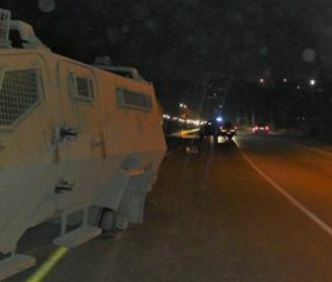 On Wednesday night, several Israeli military jeeps kidnapped a student of Polytechnic University in the Hebron district, in the southern part of the West Bank. The kidnapped Palestinian, Moneer Dofesh, was kidnapped in Nomra area, in Hebron, and was moved to an unknown destination. 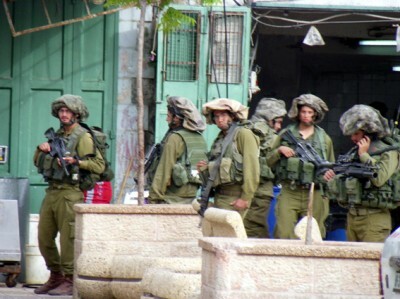 Dozens of Israeli soldiers invaded the Tabaqa village, south of Doura, in the southern West Bank district of Hebron, invaded local homes and kidnapped several children. Local sources have reported that the soldiers violently broke into and searched dozens of homes, and kidnapped at least 15 children. Some of the kidnapped children have been identified as Mahmoud Hakam Al-Harbiyyat, 12, Ghaleb Badawy Hamdan, 13, Riyadh Taiseer Abu Ras, 16, Amir Nasser Abu Hawwash, Mohammad Kamel Al-Atrash and his brother Qosai. 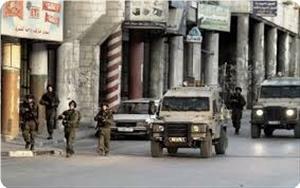 The soldiers also kidnapped resident Mohammad Yasser Abu Hawwash, 20, the Radio Bethlehem 2000 has reported. It added that the arrests started after Israeli soldiers surrounded a home, south of Doura, before violently invading it and kidnapping four residents. It is worth mentioning that the village, surrounded by illegal Israeli settlements, is subject to frequent Israeli military invasions, and various attacks carried out by extremist Israeli settlers. Israeli settlements and the illegal Annexation Wall do not only surround the Hebron district, but the hundreds of settlers live in the heart of the city and frequently assault the residents in their homes and as they move around in the city. Extremist settlers are also responsible for hundreds of attacks against Palestinian villagers, farmlands, homes and property in the city. An 85-year-old man died overnight Wednesday after inhaling excessive amounts of tear gas fired by Israeli forces in the Qalqiliya village of Kafr Qaddum, locals said, representing the first Palestinian death of 2014. The incident occurred after Israeli forces dispersed a rally in the town commemorating the 49th anniversary of the founding of the Fatah movement. 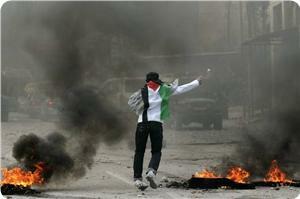 The rally marched towards the entrance of the town before Israeli troops showered the area with tear gas. A canister landed in the home of Said Jasir, causing him to suffocate. He was taken to the Al-Arabi hospital in Nablus where he was pronounced dead overnight. There are weekly protests in Kafr Qaddum to protest the expansion of illegal Israeli settlements. Hundreds of Jewish settlers stormed Yusuf tomb to the east of Nablus city at dawn Thursday under Israeli military protection. Local sources said that the storming started after midnight Wednesday and the settlers, who came in 20 buses, offered Talmudic rituals. 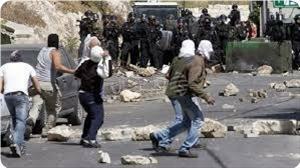 They said that violent clashes erupted between the Israeli occupation forces, escorting the settlers, and Palestinian young men, adding that the clashes were reported in Asker refugee camp and Asker village in addition to the northern entrance of Balata refugee camp and Amman street in Nablus. The sources said that the young men threw stones at the soldiers, who responded by firing teargas and sound bombs causing breathing difficulty to a number of citizens. 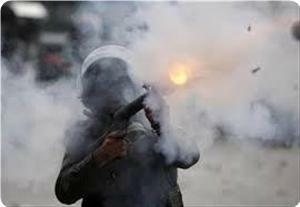 Violent clashes broke out on Wednesday in Al-Aroub refugee camp, north of Al-Khalil city, after the Israeli occupation forces (IOF) fired a hail of tear gas grenades at Palestinian homes and attacked citizens. Eyewitnesses told the Palestinian information center (PIC) that a large number of Israeli troops aboard more than 15 military vehicles stormed the neighborhoods of the camp and started to fire tear gas grenades randomly at homes, which caused many Palestinian citizens to suffer suffocation. They added that angry young men from the refugee camp responded to the invading troops by throwing back tear gas canisters at them and attacking an Israeli military tower at the entrance to the camp with Molotov cocktails. In another incident on the same day, the IOF kidnapped 10 Palestinian citizens during violent raids on homes in Al-Tabka area near Dura town. Eyewitnesses explained that an unknown person opened fire at an Israeli military vehicle near Al-Tabka area and some minutes later, scores of Israeli troops invaded the area and started to violently raid homes and brutally attack families and children. They added that the IOF also closed all entrances to Dura town and established roadblocks before they embarked on searching vehicles and checking the IDs of passing citizens. The IOF also kidnapped on the same day a university student in Al-Khalil during a security campaign in its northern neighborhoods. An Israeli settler intentionally ran over a young man on Wednesday afternoon in the neighbourhood of Wadi Hilweh in Silwan. Wadi Hilweh Information Center was informed that the settlers’ gas cylinders truck arrived at the neighbourhood of Wadi Hilweh and blocked the doors of a commercial store. The owner of the store asked the driver to move the truck which was disrupting people going in and out of his store. The driver refused and a borders police patrol arrived and the individuals came down and started verbally assaulting the locals; verbal altercations and clashes using hands broke out between the two sides. The Center added that one of the settlers intentionally ran over a young man during the incident and injured him with minor injuries in the leg. 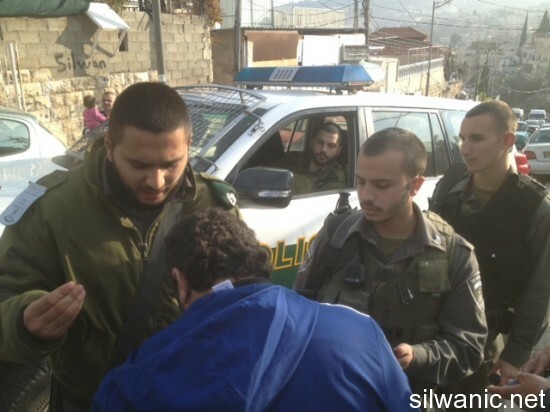 The police secured the exit of the settlers and threatened to arrest the locals. Several extremists assaulted 29-year old Ayman Ismaeel Abbasi “Abeesan” and injured him with bruises and severe wounds in his head. Ayman’s brother, Mohammad Abbasi, said that 8 extremists attacked his brother while he was driving his taxi near the central station in Jaffa Street in West Jerusalem and threw stones at the vehicle. When he pulled over to check his car, they ran away and he tried to follow them and called the police to inform them of the assault. Afterwards, another settler hit him on his head with an empty bottle which made him lose consciousness. He added that the ambulance transferred him to the hospital while he was unconscious, and after being treated he woke up and narrated what happened with him knowing that he will stay in the hospital because of suffering from a concussion. Israeli occupation forces (IOF) on Wednesday razed the tent village of Canaan 10 built by popular activists in the Jordan Valley to the east of the West Bank. Local sources and eyewitnesses said that IOF soldiers destroyed the tents and arrested eight activists after chasing and assaulting them. The sources said that the tent village was built in response to the Israeli ministerial committee’s decision to annex the Jordan Valley. They said that the IOF soldiers set up seven roadblocks leading to the area of the village to block arrival of activists. Israeli occupation forces (IOF) raided Deir Abu Da’eef village, east of Jenin, on Tuesday night and arrested a young man south of the city. Local sources said that IOF soldiers in a number of army jeeps burst into the town and started combing its alleys prompting young men to throw stones at them. They said that the soldiers broke into the home of Omar Ershayda and searched it and fired teargas canisters at the protestors causing breathing problems to some of the citizens. Meanwhile, IOF soldiers set up a roadblock at the entrance to Arrabe village, south of Jenin, and arrested a young man. IOF soldiers also last night stormed northern suburbs of Al-Khalil city and nearby areas and closed the main road, eyewitnesses told the PIC reporter. They said that the slow search of vehicles and IDs of commuters led to long queues of vehicles for two hours. Locals in Samu village, south of Al-Khalil, said that IOF soldiers in six patrols burst into the village and roamed its various alleys and streets on Wednesday morning. They said that the soldiers broke into the home of Nadi Al-Hawamde, wreaking havoc on it and terrorizing children before taking him away. A Palestinian child was wounded in Aida refugee camp, north of Bethlehem, at the hands of Israeli occupation forces (IOF) on Wednesday evening. 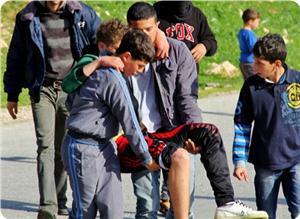 Eyewitnesses told the PIC reporter that 14-year-old Ismail Abu Alayan was hit with a bullet in his foot. They said that the bullet was fired from a silencer gun, adding that he was in the company of other children in the center of the camp when the incident took place. The witnesses said that the child was transferred to Beit Jala government hospital where his condition was described as moderate. 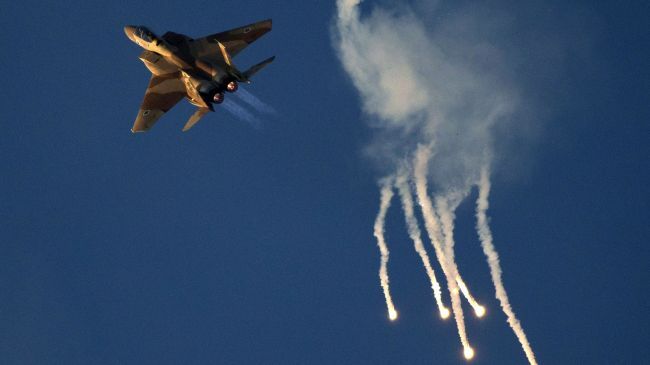 Israeli warplanes intensified flights over Gaza Strip on Wednesday morning and dropped thermal balloons especially over border areas. Local sources told the PIC reporter that resistance fighters fired a projectile at 1948 occupied lands before noon Wednesday but no faction claimed responsibility. A gunfight was reported before dawn today between resistance fighters and Israeli occupation forces near the Gaza borders. 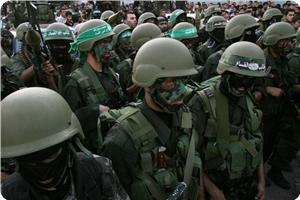 Palestinian resistance fighters engaged an Israeli army patrol near the Gaza borders at an early hour on Wednesday. Palestinian security sources told the PIC reporter that a violent exchange of fire was going on north of the Kissufim position. 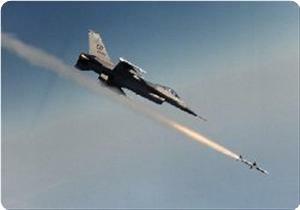 They said that the Israeli occupation forces fired flare bombs and sent reconnaissance planes. Hebrew media sources said that an IOF patrol came under gun fire near Kissufim position, but would not elaborate further. Two Palestinian students were arrested during violent confrontations with Israeli occupation forces (IOF) in Khader village, south of Bethlehem, on Tuesday. Local sources said that IOF patrols were deployed at the main entrance to the village and harassed passing citizens and students and arrested two of them. The detention triggered clashes with the soldiers, who used teargas to disperse the angry students causing breathing difficulty among a number of them, the sources said, adding that both students were taken to Gush Etzion detention center.